Eltronicschool. - This is one of free digital circuit design software that called with Digital Logic Design for Windows System. This software allow user like student and hobbyist can design digital circuits. In this moment, we will give you global description about Digital Logic Design and then we will give you the link to take free download Digital Logic Design for Windows System from external or original source. This is freely Digital Logic Design for Windows System for you who want to design digital circuit. From Listoffreeware blog describe that Digital Logic Design is a free standalone software to design digital circuits. It is a Java based program, and requires Java to be installed on your PC. You can add the following components to your design to form a digital circuit: Logic Gates, Derived gates, Flip Flops, input/Output parts, Simulation, Source, Ground, etc. Save your design as .dwg file. After your design is complete, you can simulate the circuit, and view its graphical output with the help of Scope tool. 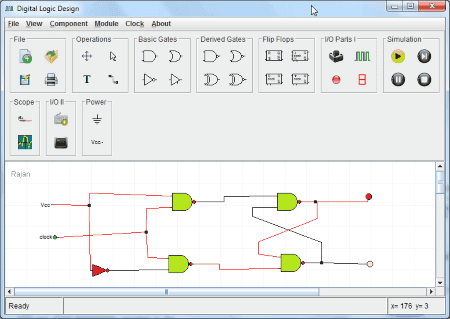 This circuit design software can be used for professional, as well as educational purposes to design Digital Logic, Computer Architecture, Embedded Circuits, etc. And now you can click the link below to take free download Digital Logic Design for Windows System from original source.